A colleague pointed out a Samsung pay-per-click (PPC) ad that made the rounds recently. 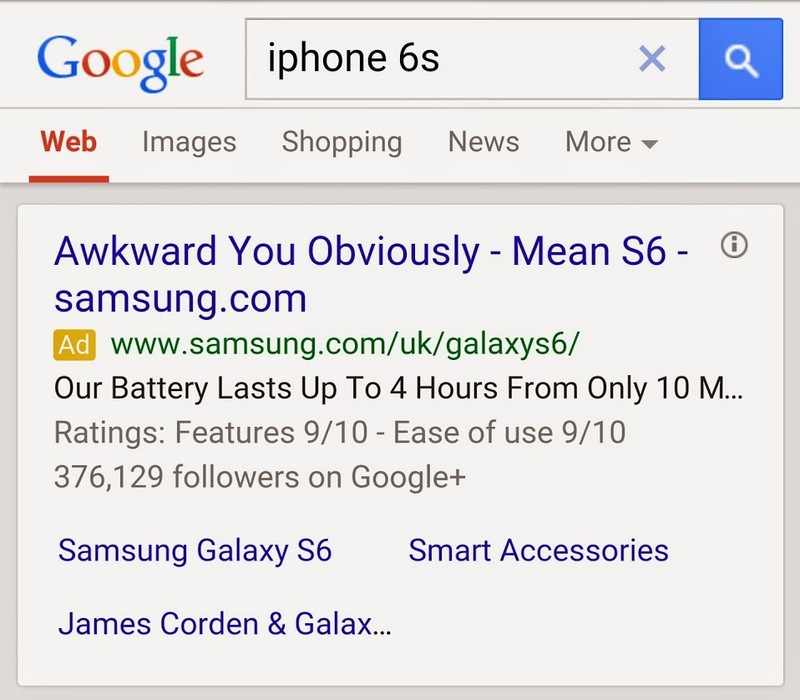 It’s an ad for the Samsung Galaxy S 6, but it shows up when users search for “iPhone 6s”. Does the ad target their ideal audience? And who is this audience, exactly? Here’s a quick breakdown and my take on whether this ad is a winner or a flop. The audience for this ad is misleading. It shows up in a Google search for “iPhone 6s.” At first glance, this implies the ad is trying to convince users interested in the iPhone 6s to buy a new Galaxy phone instead. Were this the actual purpose of the ad, I would call this campaign a huge misfire. Samsung’s new phones aren’t cool enough to actually win over any iPhone 6/6 Plus users who might be looking for info about the next iPhone model. The Edge is interesting, but it’s still a gimmick instead of a must-have feature. All of the other things the ad mentions about the phone – ease of use, charging, and features – are things iPhones rank highly for, too. No, Samsung won’t be converting anyone from iOS with this ad alone. The real audience for this ad is the Samsung tribe. Personally, I don’t really get it (since I think Samsung’s phones feel plastic-y and cheap), but there is a pretty devoted fanbase around the Samsung brand. And I bet when they saw the screenshot of this ad, they went nuts. This advertisement isn’t to win any converts; it’s to make your converts feel more entrenched in your community. This kind of tribe-building is necessary to build your 1,000 true fans and ensure a new product launch kills. Now that we know who the audience is (Samsung fans who enjoy a little bit of antagonism towards “iSheep,” as they are annoyingly referred to in comments sections), we’re better able to look at whether this ad is great or stupid. Yes – but not as a PPC ad. This ad’s purpose, I reckon, was for creating the exact image you see above. I’m guessing Samsung’s marketing team (or whatever agency they hired) carefully planted the image of this search on Reddit and worked some voodoo to get it to the homepage. This brought it to the attention of thought leader Rand Fishkin and others, who spread it virally from there. So yes, this ad works, and it’s brilliant because it works (despite the crazy grammar/punctuation in the ad copy). Samsung has plenty of resources to make their marketing work. Going viral like this isn’t ever by chance; it’s a calculated, expensive move that takes a lot of time (and more importantly, a lot of people who care a lot about brand). If you’re not a megacorporation whose customers are part of a weird internet culture war, I’m not sure this is a great strategy to follow. But it does teach a nice lesson about reaching your audience through indirect means.